This mixer is a guitaristƒ••s dream. Two of the 4 mono channels have high impedance jack inputs that can take a normal line level or a low level input from a guitar pickup, so guitars can be plugged straight into the mixer without the need for DI boxes. These inputs have been crafted to recreate the sound of a classic tube preamp in a combo or head amp for incredible definition and warmth. Two stereo inputs are provided for MP3/CD players or keyboards. ZED60-10FX has an essential selection of 16 time-delay effects, designed for small groups who donƒ••t want to carry around an effects unit with their gear but who still want great quality FX at their gigs and on their recordings. Our DSP engineers worked hard, crafting and refining beautiful reverb algorithms to enhance every performance. These effects are available nowhere else at this price point ƒ•• this quality and integration is only available from the ZED-FX. ZED effects are easily controlled using 3 buttons with 9 display LEDs. For example, the ideal delay time can be quickly tapped-in, or the perfect amount of reverb on the lead vocal can be dialled-in. There is one-stop navigation and editing ƒ•• in fact, itƒ••s just as easy as using effects pedals. To alter effects parameters, the TAP button is held down and the up/down buttons pressed to adjust the specific parameter for that effect, for example, the decay length on PLATE, or the depth on CHORUS. 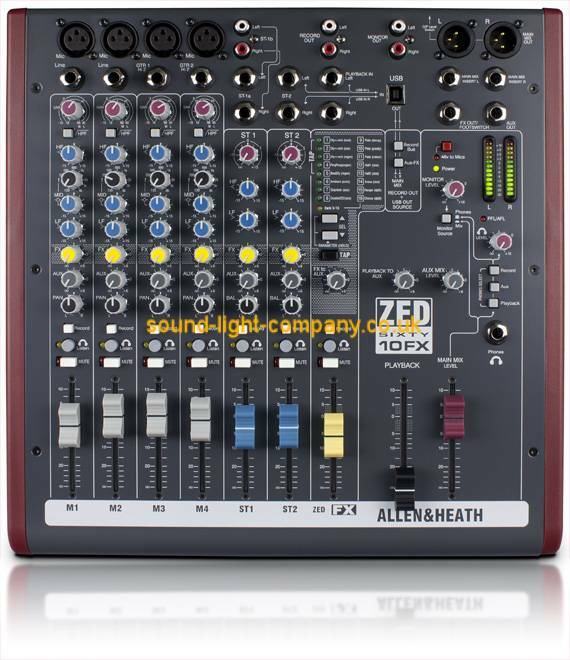 ZED60-10FXƒ••s pre-amps are similar in design to our MixWizard range of mixers, but with a twist! Inputs 3 & 4 have a high impedance jack input capable of taking either a normal line level or a low level input from a guitar pickup. These newly designed inputs have been crafted with the aim of replicating the sound of a classic guitar or instrument tube pre-amp in a combo or head amp. An extremely high input impedance ensures loading on pick-ups is minimal and a Class A FET (field effect transistor) circuit powered from 48V is employed to give the valve-like gain stage. There is a gain ƒ••Boostƒ•� switch associated with the guitar inputs which boosts gain by 26dB to cater for instruments with very low level outputs and the overdrive characteristics of the guitar inputs are very similar to a valve (tube) circuit, being asymmetric and soft. All this makes for a wonderfully natural sound to be reproduced from the instrument, full of warmth and character.